(CNN) - For the third week in a row, Mitt Romney's up with a new television commercial that claims President Barack Obama is altering the federal welfare-to-work program by dropping work requirements in the law. "Since 1996 welfare recipients were required to work. This bipartisan reform successfully reduced welfare rolls. On July 12th, President Obama quietly ended the work requirement, gutting welfare reform," says the narrator in the ad, which was announced Monday morning. 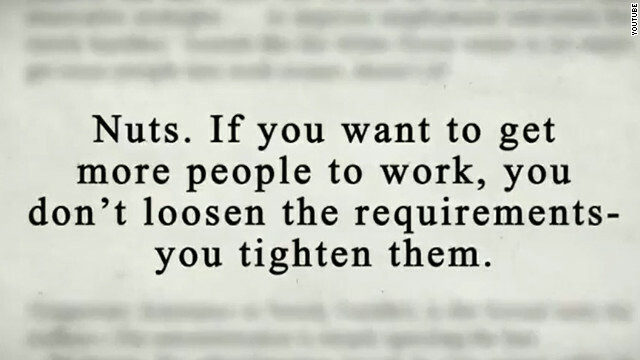 "One of the most respected newspapers in America called it 'nuts,' saying 'If you want to get more people to work, you don't loosen the requirements – you tighten them. Mitt Romney's plan for a stronger middle class will put work back in welfare," adds the narrator. The newspaper touted in the spot is the Richmond Times-Dispatch, the primary daily newspaper for Virginia's capital city. Richmond is a major media market in the crucial battleground state. An independent and non-partisan fact-checking organization, PolitiFact, rated one of the Romney campaign's earlier ad's claim on welfare as "Pants on Fire." And the Obama campaign, the White House and former President Bill Clinton, who signed the original legislation into law, all attacked the earlier spots, saying the claims were false and misleading. The Obama campaign responded Monday to the new commercial. "Mitt Romney continues to run ads that independent news organizations, former President Clinton, and the Republican co-author of welfare reform have said are not true. The Obama administration has strengthened the welfare to work requirement, not weakened it. Just one week after pledging to run a substantive campaign, and whining about the negativity in this race, it's clear Mitt Romney has absolutely no intention of living up to that pledge," said Obama campaign spokeswoman Lis Smith. Friday the Obama campaign countered the Romney campaign commercial with a spot of their own, with the narrator in the ad saying "See this? Mitt Romney claiming the president would end welfare's work requirements? The New York Times calls it 'blatantly false'. The Washington Post says: 'the Obama administration is not removing the bill's work requirements at all.’"
Regardless of the pushback, it's apparent that the Romney campaign is continuing to attack the president over welfare, with both Romney and House Budget Chairman Paul Ryan of Wisconsin, his running mate, highlighting the welfare claims in their campaign speeches last week. As is their practice, the Romney campaign would not reveal any details on where the new commercial will run or on the ad buy. Didn't these changes reflect what Romney and other governors asked for after this program started? what is it that people dont see, if you do everything for the people, you control the people and thats what obama wants, control of the people. If We The People dont kick obama out then you can guarantee that America will not see another president of a free world, but you will have the Dems and obama declaring themselves kings of America and your freedoms will be gone and you will become a slave to obama. This has been a proven LIE. Mr. Romney you need to follow your own advise and stop running these kind of ads. Again and yet again, I give you Romney America. At face value, a proven lier and cheat, over and over again. He constantly ignore the facts and cling to factual lies. I know you hate our president, but do you hate him enough to vote against your gut feeling about this Romney guy who could care less about you and america? Remember this guy Romney bets against you and america. He's betting against you as I type. Nuts. If you want to turn the country into a government controlled communist nation you get more people dependent on the government first, then you swoop in for the kill. Romney is such a lying sack of...you know what. Is he not aware that in 2012 we have the interwebz? would any America( not counting the AKIN like tea party politicians) EVER believe ROMNEY on Medicare, Welfare ...they are not dumb !!!! I just have one question. Why is this man not called out by the media over his constant lies?? Isn't this the third ad about the same lie?? Where are President Obama's attack ads? All I see are Willards constant lies. "Pants on fire" Romney was already caught lying by Politifact over his hypocritical welfare claim, yet Mitt sadly chooses to triple-down on his immoral lies. Not presidential material. Romney the liar. What more can you say. To get a waiver, a state must show that it's new approach to welfare will REDUCE THE WELFARE ROLLS BY AT LEAST 20%. The Republicans used to approve of that. It also pushes down the decision on how to run the welfare program to the states, RATHER THAN A COOKIE CUTTER APPROACH IMPOSED BY FEDERAL BUREAUCRATS. Republicans used to like that too. Their Obama-derangement syndrome is leading them to be against anything Obama is for regardless of whether it is a Republican idea. Maybe he should endorse Romney, eh? "This bipartisan reform successfully reduced welfare rolls." – No, it didn't. Look at Welfare program expenditures year over year since 1996. Look at the studies which have been done. The 1996 welfare reform was a flop. I like how Common Sense (2012 Version) presents a more detailed analysis of it. Ok, we all know this is not"TRUE" and to continue to lie about this is sad, the true message is the ryan/romney team are saying, "those lazy poor people, will never be worth sh**" but then they yell from the highest stoop, 1 in 6 people live in poverty, but then forget to mention(via) the ryan/romney budget there will be triple that amount in poverty. It is fantastic to see these last days of the Obama regime. The Liberals have been shown to be intellectually bankrupt and morally wanting. Hopefully we can get on to some responsible governance with Romney-Ryan after we sweep aside Obama and his cronies in November. More Romney lies being swallowed by the ignorant. This country is in serious trouble. These lies are a losing argument.... Makes you wonder why Romney is making it.